Be ready for your next flight at the Resorts World Manila Travelers Lounge in Newport Mall. If you have flights booked with Cebu Pacific, you can now check in at this satellite lounge located at ground floor of Newport Mall. This service is available during mall hours, or up to 8 hours before your scheduled flight. 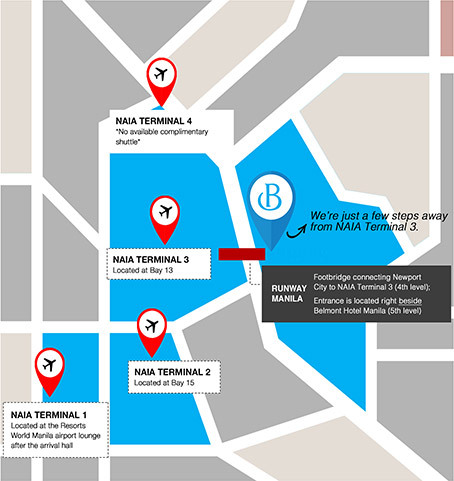 Terminal 3 can be conveniently accessed via the Runway Manila Bridge and a 24-hour scheduled free shuttle service is available to Terminals 1 and 2. Convenient and enjoyable travel for you and everyone else! 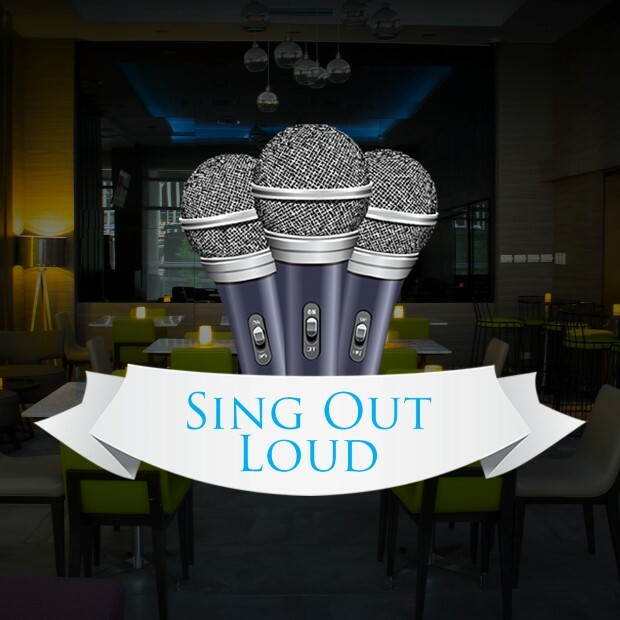 If you’re tired after a long flight, or looking for a comfortable place near the city’s entertainment centers, this hotel in Newport City, Pasay, Philippines has all these and more. 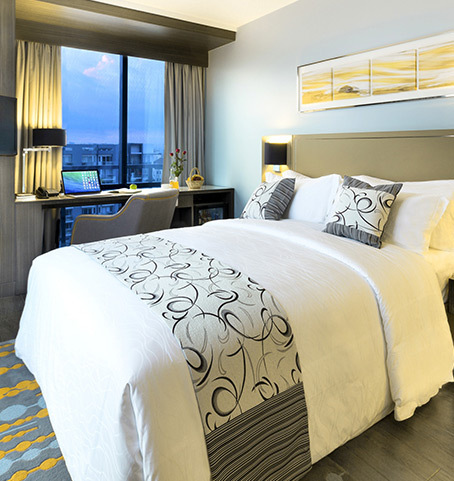 Guests and travelers alike can reach this 4-star hotel by crossing Runway Manila – the bridge that connects it with the Ninoy Aquino Airport Terminal 3. All it takes is a quick stroll and a short elevator ride. From here, our friendly staff will guide you to your rooms and you’ll be ready to rest or explore Newport City. Checking in is a simple process, and your every need will be attended to. Once you settle in, our smartly-designed rooms provide all the necessary comforts to relax. These include LCD TVs, rain showers and complimentary Wi-Fi access – everything you need for a most pleasant stay. Guests can also enjoy a free turndown service to prepare the room for a good night’s rest. These suites are the perfect place to unwind after a long flight, right before you explore the city. Indulge in our hotel’s finest comforts and be refreshed. From a pool with a magnificent view of the city to an array of modern function rooms, Belmont Hotel Manila has all the facilities you need for both business and leisure. Take your pick among several options for your enjoyment. After the day is done, get a good night’s rest at our rooms. 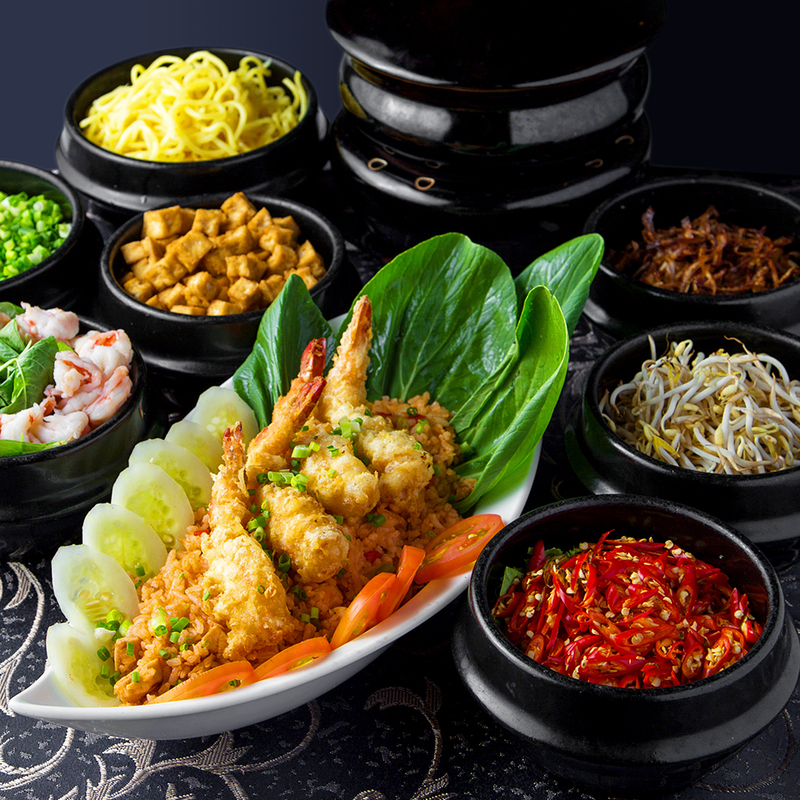 You can also try out the food at our restaurants, or take a swim in our pool to unwind. Our hotel in Manila, Philippines puts you at the center of places like shopping malls, spas, and entertainment centers. Exploring the nearby areas is also recommended. Check out the establishments within your reach and enjoy a vacation experience that’s truly your own. You’ll surely be impressed with what Belmont Hotel Manila and its surroundings have to offer you.